Hey everybody! Welcome to the first installment of my Space:Queens segment, where I explore afrofuturistic art, culture and influencers in my home borough of Queens, NY! First up is Yvonne Shortt, who is the creative director of RPGA Studio, Inc., and is the curator for Queens Art Initiative, where she works on several community-based art and technology projects in the borough. Enjoy! 1) Tell the readers a little bit about yourself and and what inspired your love of technology and math. I’m an an artist, mathematician, African American female, technologist, and mother. My inspiration came from my uncle who started a company to help the deaf communicate with others and my mom who bought me my first computer, a Commodore 64. Also my aunt, her belief that hard work makes all possible shaped me. 2) How do you see Queens as a place of possibility and speculative/futuristic exploration? We have so many people from so many countries and this diversity is an amazing power to draw from. It reminds me to use diversity in my work in my exploration – diversity including art, design, technology, education… This is what makes my work important and relevant I think. 3) How are you using technological and artistic innovations to change your community in Queens and to stir imaginations of local community members? I use tech and art to creatively address problems. When I see a deteriorating wall and crumbling cement, I can draw from my toolbox and use so many different tools to address the issues: A virtual reality headset to help people visually see a different possibility for the space; art skills to collaboratively work with the community to create a better space; and design skills to advocate to the DOT and LIRR for differently designed sidewalks, ones that that don’t allow garbage to be caught in the sides. Because of the diversity in my toolkit, my viewpoint is not just about using one approach to solve or explore a problem but taking a multi-prong approach. We can look at the NYS Pavilion,presenting exciting and bold ways to get people interested in reimagining the NYS Pavilion, like virtual reality headsets to show the history and a new future for the purpose of the tent of tomorrow, stereoscopes to give people ideas using an old way of rendering 3D, a 3D designed and fabricated tent of tomorrow that uses kinetic sculpture to show appealing architectural additions, and designers to help the public put their ideas in CAD software do others can easily understand how they want to reimagine the tent. 4) What have been some of your favorite projects so far? I love virtual reality programming, so I love my project with the National Trust and People for the Pavilion where we not only help inspire people to reimagine but then give them the tools to put their ideas on paper. I also loved my 63rd Drive installation because it used old school cameras to capture over 300 photos with the community. Then those old school photos were blown up and mounted on a wall after the community helped create a 1500 square foot mural. This project was the first time I incorporated paint and photography into a collaborative mural and the results were aesthetically pleasing. Lastly, my work around transportation safety is exciting. Using virtual reality and creating a card game that my team and I take to schools to use repetition to change behaviors and our Transportation safety kiosks that will be out in the streets this summer armed with a person to empower the community to record dangerous streets for the DOT – I love this stuff. 5) One of the projects that you created was Stat Girl, a super hero displaying statistics on traffic accidents that have occurred on Queens Boulevard. Who have been some of your favorite heroes and superheroes who inspired you growing up? Growing up I was inspired by my mother’s compassion and ability to forgive. My aunt also inspired me because of her ability to focus on something and work hard to achieve it. Then, there was my uncle who imagined the world not as it is but how it could be. These people -Uncle Leonard, Aunt Elsie, my mom, they are my heroes . 6) Why is community-based technological and artistic innovation so transformative and empowering? 7) What are some future ideas and projects that you are considering now? We will be in several festivals including the Arts and Ideas festival in New Haven, Connecticut showcasing the art, virtual reality, 3D printing, and collaborative design we use to inspire our community. This is so awesome! To be involved in a festival focused on using art to shape ideas- more specifically my art shaping the New Haven communities ideas-I’m so happy! We are going to have a dinosaur running around on the green-not a real one- a virtual one. Won’t the kids and adults be excited? I hope so! We are going to take our Reimagining the NYS Pavilion installation mobile around NYC. Our goal is to again use art, Virtual Reality and 3D design/printing to get adults and kids excited about the NYS Pavilion and its significance today as an architectural and historical landmark and a place to shape a new urban landscape for the Queens community. 8 ) Since this blog is called futuristically ancient, how are you both futuristic and ancient? Does age count? Just joking! I believe our past is important and I incorporate it in my artwork. 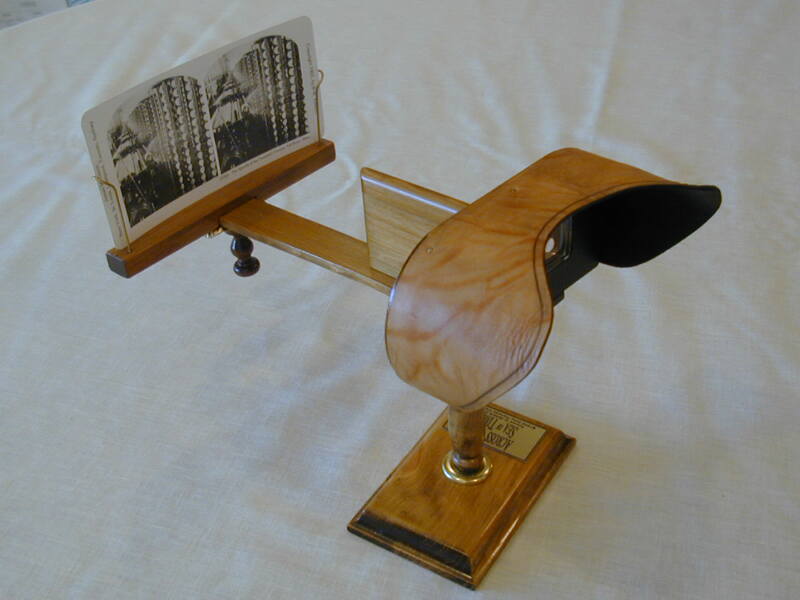 I’m currently using a stereoscope from 1891 in my NYS Pavilion installation. It has a calmness a quietness that is beautiful. And this is who I am -a person who draws from the past, use it to create immersive experiences, and adds some interesting technology to help shape the present and the future. And of course there has to be art in the technology. Thank you Yvonne!! If you are in Queens and you would like to find out more about any of Yvonne’s project’s, please visit the RPGA Studio, Inc. website. Also, public programs for the NYS Pavilion ideas competition continues this Sunday at Flushing Library! Bring your ideas for reinventing this Queens’ architectural icon! PreviousMoving on the Wires: Lucy’s Bone Scrolls Chapbook!